ww2dbaseArthur Neville Chamberlain was born to Joseph Chamberlain, Lord Mayor of Birmingham. He was educated at Rugby School; his classmates at Rugby remembered him as a shy boy. He then attended Mason Science College. After university education, he worked for an accounting firm. After some time as a failed plantation owner in the Bahamas, he returned to Britain and embarked on a successful career as a manager for several companies. In 1911, he entered politics at the Birmingham City Council, and in 1915 became the Lord Mayor. In 1916, he became the Director of National Service and managed the labor force in Britain during WW1, but he bumped heads with Prime Minister David Lloyd George; he resigned in 1917. He entered Parliament at the age of 49, where he refused a junior ministerial position and knighthood due to his protest of the Lloyd George government. In 1922, Andrew Bonar Law became the Prime Minister, and appointed Chamberlain as the Postmaster General, then later Minister of Health. In the latter position he introduced several programs that reformed housing laws. During Stanley Baldwin's term as Prime Minister, Chamberlain was promoted to the Chancellor of the Exchequer for one term; at the completion of the term he returned to the role of Minister of Health. In 1930, amidst infighting within the Conservative Party, Chamberlain took leadership of the party as its chairman, but Baldwin eventually retained true leadership. ww2dbaseOn 24 Aug 1931, at the formation of a unified National Government, he returned as the Minister of Health, then within the same year the Chancellor of the Exchequer. In this second term as the Chancellor of the Exchequer, he promoted protective tariffs that would mold the British Empire, containing the United Kingdom, the Dominions, and lesser colonies, into one economic community that would be self-sufficient. He also worked to improve the debt situation, a legacy of WW1. His efforts to reduce debt, however, were attacked by the likes of Winston Churchill who accused him of undermining the defense expenditure at a time when Adolf Hitler's Germany was undoubtedly preparing for war. In 1937, Chamberlain introduced the National Defense Contribution that taxed excessive profits in the industrial realm, which gathered much opposition against him. Another contribution of Chamberlain during his second term as Chancellor of the Exchequer was the nationalization of certain old factories and mines that were devastated during the Great Depression. While he meant to protect these industries, the long term effect of the nationalization actually turned out to be one that gave Britain a greater capacity for manufacturing for WW2. "[m]ore than any man except Hitler - and Hitler could not have done it without him - [Chamberlain] was responsible for the transformation of Germany into the most powerful military state in Europe, which had begun, with Teutonic efficiency, the destruction of all European Jews and had turned the Slavs in the vast lands it conquered into sklavenarbeiter - slave laborers." ww2dbaseOn the evening of 10 May 1940, Chamberlain resigned. King George VI appointed Churchill as his successor. Chamberlain stayed in the Conservative Party and remained influential. Churchill wished to name Chamberlain the Chancellor of the Exchequer and Leader of the House of Commons, but political pressures on Churchill prevented this from happening. Instead, Chamberlain became the Lord President of the Council in Churchill's government. Chamberlain's support among Britain's politicians varied; some wanted him out of government altogether for his inability to prevent war, while others deeply believed he would undoubtedly return to the role of Prime Minister. In Jul 1940, however, his health deteriorated very quickly and had an operation for stomach cancer. In Sep 1940, he resigned from his office as well as the Conservative Party, though Churchill did allow him to continue to receive classified information about the war in order to keep him informed of the situation. ww2dbaseChamberlain died of cancer in Highfield Park, Hampshire, at the age of 71 in Nov 1940. "This morning the British Ambassador in Berlin handed the German Government a final note stating that unless we heard from them by eleven o'clock that they were prepared at once to withdraw their troops from Poland, a state of war would exist between us. I have to tell you that no such understanding has been received and that consequently this country is at war with Germany." "It is evil things that we will be fighting against—brute force, bad faith, injustice, oppression and persecution—and against them I am certain that the right will prevail." 18 Mar 1869 Neville Chamberlain was born in Birmingham, England, United Kingdom. 28 May 1937 Neville Chamberlain became the Prime Minister of the United Kingdom. 24 Mar 1938 British Prime Minister Neville Chamberlain rejected the Soviet request to form an international bloc to contain German aggression. 30 Jul 1939 British Prime Minister Chamberlain wrote in regards to the German oppression of Jews "[n]o doubt Jews aren't a lovable people, I don't care about them myself. But that is not sufficient to explain the pogram." 9 Sep 1939 British Prime Minister Neville Chamberlain's cabinet planned for a 3-year war. 9 Oct 1939 British Prime Minister Chamberlain announced a committee of ministers to coordinate the war time economy. 12 Oct 1939 British Prime Minister Neville Chamberlain rejected Adolf Hitler's proposal for a multi-power conference for peace made on 6 Oct 1939. 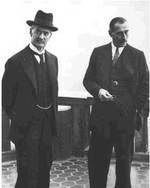 1 Feb 1940 In the British House of Commons, Prime Minister Neville Chamberlain declined to accept a suggestion by Herbert Morrison that a Minister of War Economy should be appointed on the grounds that such a post would do nothing which was not already being done. 24 Feb 1940 British Prime Minister Neville Chamberlain condemned Hitler's aggression but said that he was prepared to negotiate with an alternative German government. 19 Mar 1940 Members of the British House of Commons debated Britain's lack of action during the Winter War and criticized Prime Minister Chamberlain. Chamberlain noted that Finland never officially requested British military aid. 31 Mar 1940 British Prime Minister Chamberlain called off the mining of the Norwegian coast in protest of the French resistance to the mining of the Rhine River. 5 Apr 1940 British Prime Minister Neville Chamberlain announced that a German invasion of Western Europe would not be successful. 7 May 1940 Prime Minister of the United Kingdom Neville Chamberlain faced criticism during the Norway Debate. 8 May 1940 The opposition party in the United Kingdom, the Labour Party, called for a vote of no confidence for Prime Minister Chamberlain's government. Meanwhile, former Prime Minister David Lloyd George called for Chamberlain to step down for the good of the country. 9 May 1940 British Prime Minister Chamberlain offered to form a coalition government with the opposition Labour Party, but the attempt was unsuccessful. In the afternoon, Chamberlain began to discuss with Halifax and Churchill, the two leading contenders to be his successor, about the possibility of his resignation. 3 Oct 1940 British politician Neville Chamberlain resigned as Lord President of the Council for health reasons. 9 Nov 1940 Neville Chamberlain passed away of cancer. 14 Nov 1940 Neville Chamberlain's funeral was held at Collegiate Church of St Peter at Westminster, or Westminster Abbey, in London, England, United Kingdom. He was a very important man in British history. I am doing a report on Neville Chamberlain. This does give a lot of information but I need to know about him in the world war 2. 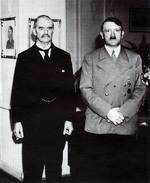 Neville Chamberlain was my Mom's cousin and therefore my 2nd cousin and a very much misjudged and maligned man he tried to see the best in people and was often fooled but he always did his best for his family, his country and his king. I for one am proud to be a family member .